I’m sure we have all received advertisements through the mail from companies that want to pull you in with discounts and promotions. They usually have a catchy tagline, a form you can fill out for more information, and a well-crafted letter explaining why you need their services. The truth is, most people throw out these letters. We receive so many of them that we don’t even take the time to look at them anymore. How do you change this behavior? How do you ensure that people will actually look at your mail and possibly give you a call? We have already talked about How to Make Social Media Work for You, and to round that off we bring to you the magic of lumpy mail. 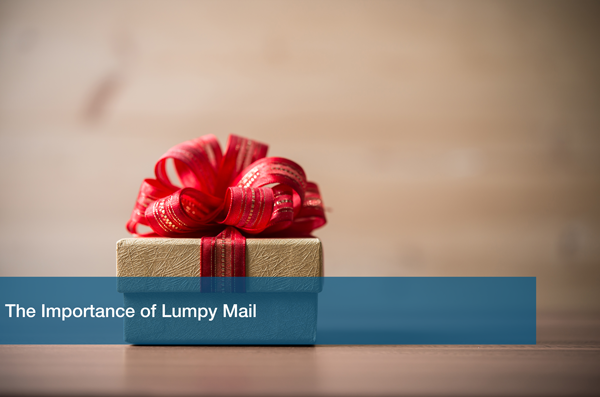 Lumpy mail is exactly what it sounds like. Mail that is lumpy. It is a package that contains little knickknacks as well as a letter and some business cards. Lumpy mail is an attention grabber. If you receive multiple envelopes and a lumpy package, which one do you reach for first? The lumpy package! You actually open it with enthusiasm. This is what companies are starting to realize. People love opening packages! Sending them one ensures that it actually makes it to their hands and will be opened. Now that you have a better chance of getting them to open your package, what do you put in it? Business cards? Pens? Coupons? That is ultimately up to you. If they are a potential customer, include fun facts and little knickknacks about your company. Stickers, pens, infographics, anything that will bring some form of entertainment while also giving them more information about your company. If you have fun little stress balls with your logo on them, send them along! Add a fun tagline to your letter that relates to whatever object you are sending them. I have seen doctor’s offices send pens that look like syringes. Make the package memorable so they make a note to find out more about your company. Because the package is not a typical envelope, it might cost more to ship it than a regular letter would. You can send a couple of “test” packages to see the reaction to them, and gauge whether or not to send them, or how many to send at once. If you make an amazing package that yields positive results, then the cost to produce and send them will balance out in the end. The main goal is to get your name out there. By sending them an object with your company name, they now have a permanent piece of your logo on them. Even if it is just at their desk, it is something they can look at. Expanding your outreach to as many people as possible is quite easy to do nowadays. Amazing websites, solid social platforms, and clever marketing are going to take your company to the next level. At ITC we pride ourselves in always delivering above and beyond IT service to our customers. We can help you design your website to better suit your company’s needs. Call or visit us today to Schedule a Free IT Analysis to get started.